The roughly 40-km diameter Azuara impact structure (Fig. 1) is located in northeast Spain 50 km south of Zaragoza (see Azuara from space). From stratigraphic considerations, its age is estimated to be Upper Eocene or Oligocene (Fig. 2). Except for very small magmatic intrusions, the target was purely sedimentary, which is a rare case with very large impact structures. The target was composed of the roughly 10 km thick Paleozoic core of the Iberian chain and the Mesozoic cover overlain by Tertiary molasse sediments of probably 1000 – 2000 m thickness. This prominent thickness of more or less loosely bound sediments and the carbonate rocks prevailing in the sedimentary sequence are related to many peculiarities of the Azuara structure such as relics of carbonate melt, a special facies of the impact ejecta, and distinct breccia dikes. Young post-impact sediments widely hamper the investigation of the central part of the Azuara structure. Therefore, most outcrops concentrate on the rim region (Fig. 2) where they are very abundant enabling excellent insight into the geology of the impact process. Fig. 1. 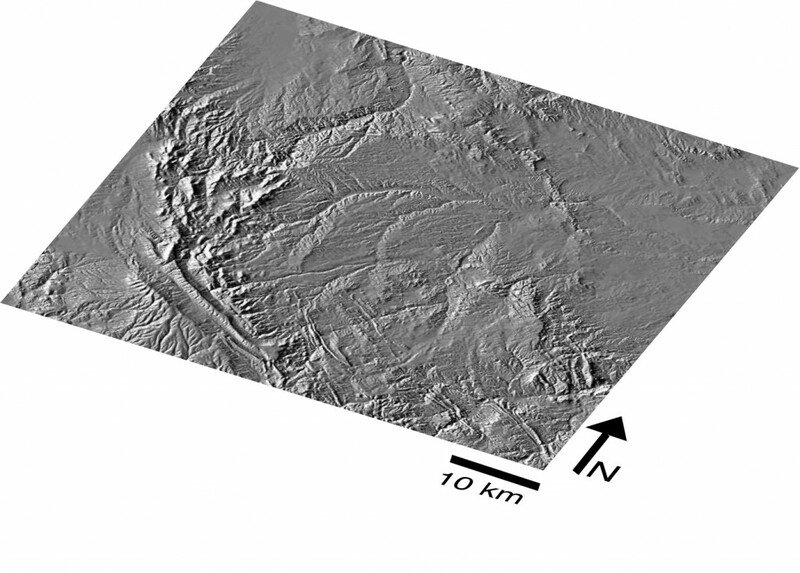 Morphological signature of the Azuara structure taken from the digital map of Spain, 1 : 250,000. The image has been performed by Manuel Cabedo. Fig. 2. 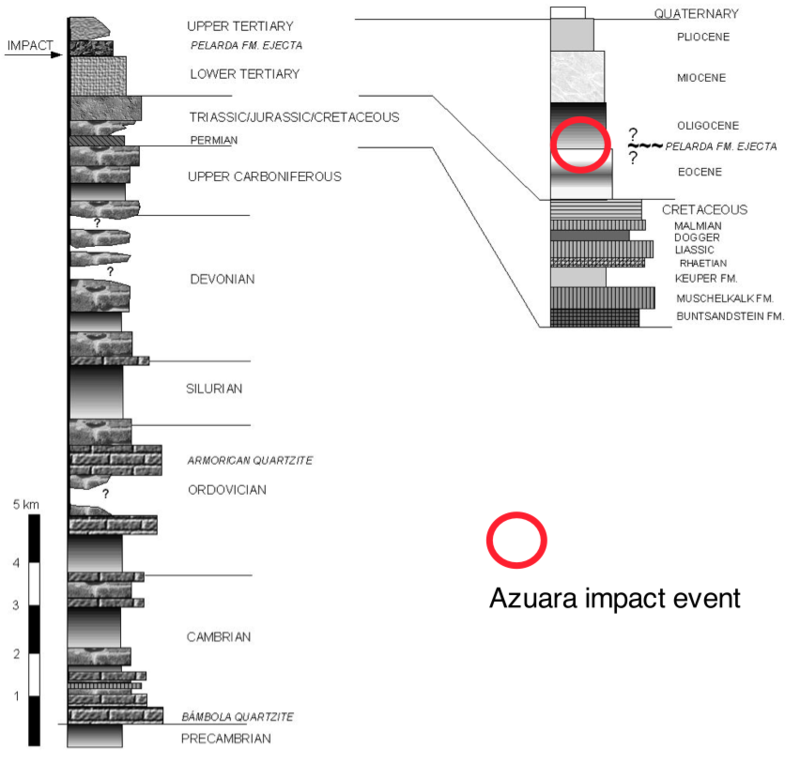 Stratigraphic column of the Azuara impact target. Fig. 3. 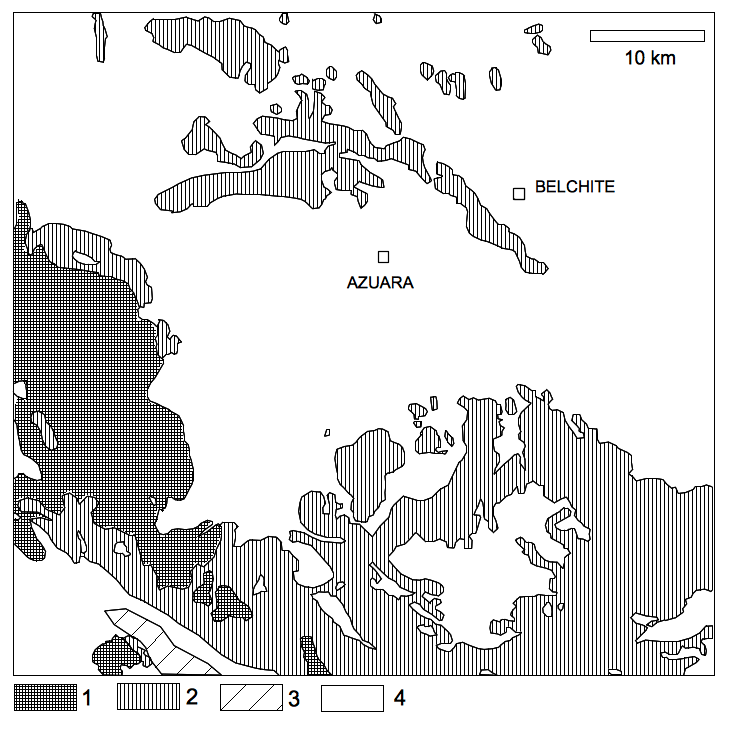 Geological sketch map of the Azuara impact structure. 1 = Paleozoic, 2 = Mesozoic, 3 = Pelarda Fm. ejecta, 4 = Cenozoic. Modified from Ernstson et al. (2002). The impact hypothesis for the Azuara structure was first established by Ernstson et al. (1985). Until then, the structure attracted practically no interest except for a paper by Carls (1983), wherein a tectonic Azuara block has been mentioned. Later, Spanish geologists in general considered the Azuara structure a basin which was formed by syn-tectonic sedimentation (e.g., Aurell et al. 1992, 1993, 1994). More recently, the Azuara structure has also been suggested as to originate from a granitic intrusion (Sanchez Cela 1997). The model of a giant meteorite impact is based on a very detailed geological mapping, geophysical measurements, photo lineation studies, and petrographic analyses of about 1,000 thin sections. From these investigations (see list of references), the impact is documented by gravity negative anomalies, abundant monomictic and polymictic breccias and breccia dikes (frequently displaying shock-metamorphic effects such as diaplectic glass, melt particles, all kinds of planar deformation features [PDFs] , extended and thick megabreccias, a large quantity of dislocated megablocks, hydrothermal signature (Siegert 1997), and extended and thick impact ejecta (see the submenu). Among these observations, especially the shock-metamorphic effects indicating extremely high pressures ( several 100 kilobars = several 10 GPa) and temperatures (> 1000 °C) are basically incompatible with models of an endogenetic origin (by tectonics, syn-tectonic sedimentation, granitic intrusion) of the Azuara structure. The following list of references comprises both papers written by authors favoring an impact origin and authors basically suggesting an endogenic origin of the impact features. Sanchez Cela, V. (1997) “La estructura circular de Azuara (Zaragoza). Origen endógeno versus impacto.” Boletín Geológico y Minero 108: 121-128. An excellent and very detailed geological mapping on a 1 : 10,000 scale of the N rim of the Azuara structure between Aguilón and Fuendetodos has been performed by H.Feld within the frame of a DFG (German Science Foundation) research program.